Personalized 24" x 24" Oversized Square Address Sign - - 24-inch square address plaque holds four lines of personalization with up to 16 characters per line. Made in USA. Custom made with your personalized text and color scheme selection. All lines of text hold up to 16 characters including spaces. Number of characters determines their actual size. It is not necessary to use all four lines. Please leave the input box blank if not using the line. The large size of this highly visible address sign also make it perfect for mounting at corporate and club entry drives and suitable for facility identification information and commercial signage. 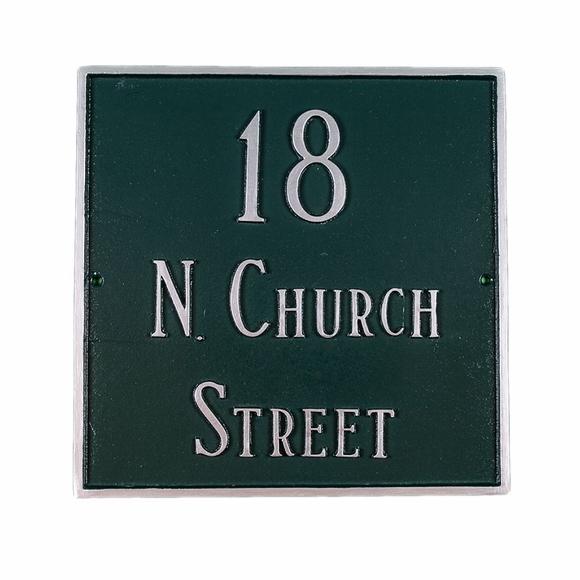 Oversized square address plaque personalized just for you. Made in USA.